Think of authentic footballing shocks over the last decade, and what comes to mind? The Greek triumph of Euro 2004, for one: beating the holders (France), the strongest team (Czech Republic) and the hosts (Portugal) along the way. Chelsea stunning Barcelona in 2012 was another spectacular result. Another candidate would be the dispirited and disjointed French team of 2006, somehow dragged till the finishing line by the ageing but magical Zinedine Zidane (taming Spain, Brazil and Portugal along the way). The single biggest shock of the lot, though, has to be Senegal defeating France on the opening day of WC’02. It was the first international match I’d ever watched, and I came away with a (wrong) impression that international football must generally be unpredictable and fun to watch. Few matches have shaken the landscape the way that match did. When Papa Bouba Diop scored the sole goal of the game, the stadium erupted. France, who had qualified for the tournament by dint of being holders, were complacent and badly exposed. Zidane didn’t play that match; but their much-vaunted attackers, all playing for major European clubs, could not find a way around Senegal’s 5-4-1. 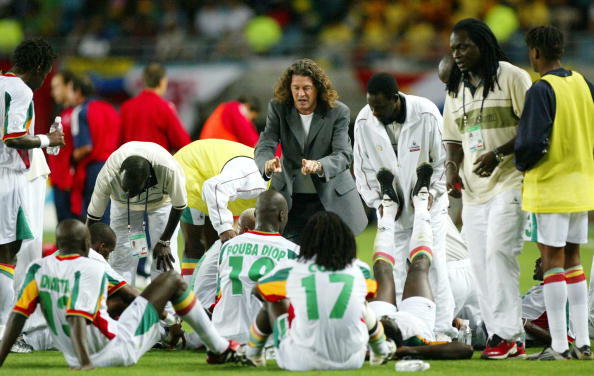 The mastermind of that result, former Senegal manager Bruno Metsu, lost his battle with cancer today morning. Nicknamed ‘The White Sorcerer’ in Africa, he took Senegal till the quarter-finals of that tournament – the first African team since Cameroon in 1990 to achieve the distinction. He later managed a series of clubs across the Middle East, usually with good results; winning the AFC Champions League and the Gulf Cup. But the result he obtained against his home nation would define him for the rest of his career. France never recovered, and crashed out of the group stages without scoring a single goal. Later, he added Sweden to his list of conquests. Senegal’s, and Metsu’s luck ran out against Turkey – but his name was made, especially in Senegal, where he is an iconic figure. He converted to Islam, married a local woman and renamed himself Abdullah, further endearing himself to the local populace. Metsu is gone, but the memories will stay. By its very nature, football will continue to produce upsets, but nothing will compare to the one I witnessed on my viewing debut that evening of 31st May, 2002. But will we ever see such a result again? Club football follows a straightforward pattern these days: several teams play a series of matches laced with drama and high tension; and in the end Barcelona or Bayern Munich will win. Or, at the very least make the last 4 and fail to win only because of a series of self-inflicted wounds. I’ve lamented this point in-depth already, so will avoid a painfully boring ramble along pre-determined lines. International football should theoretically be more evened out, because there is no lopsided player market here – but again, Germany, Spain and Brazil have a headstart here, so you can be sure one of the usual suspects will win. The top of the food chain has stayed unchanged. What has changed, though, is the foot of the ladder. There are no underdogs left in international football. As in club football, the major international teams have consolidated themselves at the top. Consequently, the likes of Croatia, Turkey and Czech Republic – all of which saw a generation of greats rise and fall – have disappeared from the scene. Perhaps another generation will rise. There may be another Diop somewhere, quietly biding his time and waiting to lead an unlikely charge against the unsuspecting Brazilian backline. Or maybe, after all, Darwin was correct and the fittest have inherited the earth. But I, for one, certainly want to believe.